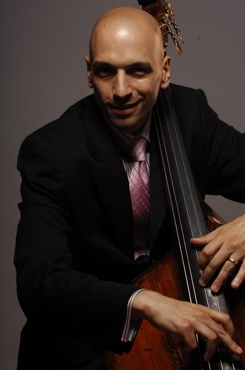 Grammy award winning bassist Phil Palombi is “one of the most sought after bass players in New York City”, according to Steely Dan tenor saxophonist and renowned jazz musician Walt Weiskopf. His performance and recording credits include such players as, Toshiko Akiyoshi, Michael Brecker, Randy Brecker, George Coleman, Maynard Ferguson, Billy Hart, Louis Hayes, Vincent Herring, Etta Jones, Billy Kilson, Joe Lovano, Dave Liebman, Harold Mabern, Steve Smith, Curtis Stigers, Lew Tabackin, Mark Turner, Chucho Valdes, and The Village Vanguard Orchestra to name a few. Upon moving to New York City in 1997, he immediately began working full time performing at many of the city’s venues. In addition to being an internationally recognized bassist, Phil is known for being the author of Scott LaFaro – 15 Solo Transcriptions, the first book of LaFaro solos ever published. Scott LaFaro was one of the pioneers of jazz bass soloing and book contains all 15 of his solos taken from the Bill Evans recordings Waltz for Debby and Sunday at the Village Vanguard. Publishing this book opened up many doors, perhaps the largest door being access to LaFaro’s amazing 1825 Abraham Prescott bass– the very bass that LaFaro used on his recordings with the Bill Evans trio. In 2015 Phil was granted use of LaFaro’s bass for the first 6 months of the year, recording his third CD as a leader Detroit Lean in May and headlining the International Society of Bassists convention in Fort Collins, Colorado in June. Perhaps the biggest event for Phil that spring was returning to the Village Vanguard with Scotty’s bass for two performances with the Vanguard Jazz Orchestra, which marked the first time that the instrument had crossed though those hallowed doors since LaFaro himself walked through them to record Waltz for Debby and Sunday at the Village Vanguard with Bill Evans in 1961. However, this wasn’t the first time Palombi had played this amazing instrument. 2011 marked the 50th anniversary of the death of bass legend Scott LaFaro, who Phil honored in his recording RE:Person I Knew – A Tribute to Scott LaFaro. The recording features the working trio of piano legend Don Friedman and Bill Evans alumnus Eliot Zigmund on drums. The special guest on the recording was LaFaro’s bass. Barrie Kolstein, the owner of the treasure at that time, with the blessing of the LaFaro estate, granted Phil the honor of using the instrument for the recording as well as the weekend CD release concerts months later at the Kitano Jazz club in Manhattan. This was a first for the instrument, having not been played professionally since LaFaro’s last gig with Stan Getz in Newport a week before his tragic accident. When Phil isn’t busy working as one of NYC’s first call sidemen, he is actively pursuing music with one of his collaborative trios: Tri-Fi and . Tri-Fi came together as the backing band for Concord recording artist Curtis Stigers. Backing Curtis took Phil to nearly every continent, performing over 100 dates a year. Playing that many gigs a year with the same band is a rarity these days. In 2005 the backing trio formed the group Tri-Fi. With six CDs released as of 2016, they have garnished rave reviews by such publications as Downbeat, Playlist Magazine, All About Jazz, and The London Times. The name  refers to the area code of the boroughs surrounding Manhattan where most of the creative artists have fled to over the last decade. This trio, which features Fender Rhodes and drums, has been a great outlet to showcase Palombi’s considerable electric bass chops. Completing the popular LaFaro book opened up a new avenue of expression for the bassist. After attending a master class that Phil was presenting at the International Society of Bassists convention in 2005, the editor of Double Bassist Magazine hired him to write a five page article for the publication. The article (on Scott LaFaro, of course) was so well received that Phil was asked to write for the magazine on a regular basis, expanding his method of jazz analysis beyond the great LaFaro to other bassists such as John Patitucci, Charlie Haden, and Eddie Gomez. A whole new career as a clinician began to emerge, with return appearances to the 2007, 2009, and 2015 ISB conferences, the European bass festival Bass2012 in Copenhagen, Denmark, as well as master classes at many high schools and colleges (with Eastman School of music being the most notable). Phil’s studies began at Dana School of Music at Youngstown State University, where he pursued a dual major in Jazz and Classical Performance and Music Education. He studied jazz and classical acoustic bass with Tony Leonardi while keeping up with a heavy load of ensemble rehearsals and concerts. For five years Phil was the bassist for the Down Beat award winning Jazz Ensemble I of Youngstown State, where he played with jazz greats Nick Brignola, Donald Byrd, Terry Clark, Eddie Daniels, Benny Golsen, Duffy Jackson, Chuck Mangione, Bob Mintzer, Marvin Stamm, Lew Tabackin, Bill Watrous, and Jiggs Wigham. Because of this superb jazz program, Phil was selected for the Ohio All-Star College Jazz Ensemble lead by drummer John Von Olen and trombonist John Fedchock in 1993. In addition to his studies, Phil was also a very busy working bassist in the Youngstown, Pittsburgh, and Cleveland music communities. Although he enjoyed his work subbing with the Warren Chamber Orchestra for a few seasons, performing with the Greenville Symphony for two seasons, and becoming a regular member of the Youngstown Symphony Orchestra for four years, jazz was becoming his main focus. By his senior year in 1994, Phil was heavily involved in the Cleveland jazz scene, playing nightly with artists such as Greg Bandy, Ernie Krivda, Chip Stephens, and Dan Wall. As the president of the school’s jazz society, Phil was able to obtain funding to bring the legendary jazz bassist Ray Brown to Youngstown for a master class. During Mr. Brown’s brief stay, Phil managed to take a private lesson with the master, which ultimately sealed the door to Phil’s classical career and set him on the path to becoming a full time jazz bassist. By the fall of 1995, Phil had caught the ear of trumpet virtuoso Maynard Ferguson, and was offered a job with his new nine piece group Big Bop Nouveau. During his two year tenure with Maynard, he recorded the CD One More Trip to Birdland (for Concord Records), a track for a Concord Christmas CD, and performed on the television shows of Pat Boullard, Crook and Chase, Good Morning Texas and Jazz Central on the B.E.T. Network. After performing with the King of Thailand in Bangkok, Palombi left Maynard to move to New York City, where he currently resides.